July 4 News | Jobs in Film, Audio, Radio. The great thing about learning on the job is that it presents you with opportunities to begin building your career while you’re still a student. That’s exactly what we found when we caught up with Recording Connection apprentice Desiree Holiday a few weeks ago. Even while finishing her basic course with producer/engineer Ric Web (Taylor Swift, Alan Jackson) at South Street Studios in Nashville, TN, she’s already landed a paid gig recording an aspiring rapper, and she’s even bringing him into her mentor’s studio as part of her ongoing training! Like most things, it began with a connection. “It’s actually a friend of a friend who is an aspiring rapper,” she says. “He basically came to my house one day and was like, ‘I know you’re doing recording. I would love to record this song with you and have you mix it.’ And I said, ‘Great.’ And it was really that simple.” It’s funny because we live in the same apartment complex, so we already kind of knew each other from that and from us having marched in the same band at the same college.” Desiree’s training kicked in right away, and she could hear what needed to change. “We cut the vocals in my house with my modest setup,” Desiree explains. “I noticed some mistakes I made, some things that didn’t come through quite clearly, and I just asked my mentor if we could redo them at his studio. And you know, I put it to my artist: ‘It might cost a little more, but it’s way worth it.” And from there, it just sparked. He loved the sound we got. He loved how I worked with him. What felt good to me was the confidence that my mentor gave him right before he let us have the studio. Between then and now, we’ve been able to really embark on a bigger project. Now he wants to record almost seven tracks with me at my mentor’s studio, and he is willing to pay the price.” Desiree’s passion for music in general (and audio engineering in particular) was sparked in a rather unusual way—playing trumpet in a marching band. “I started playing trumpet in the fifth grade and marched in the band in high school, [then] marched in the Aristocrat of Bands in college at Tennessee State University,” she says. “It wasn’t until I actually got to college that I knew what I wanted to do is music. I knew music was there, I just never knew how it would be because I wasn’t the best trumpet player per se, but loved music. I came across the engineering aspect and from there, I just knew that is what I wanted to do.” Because of her new interest in audio engineering, Desiree chose to major in mass communications in college because it was the “closest thing” to what she was looking for—but she knew when she graduated she’d need more intensive training if she was going to be serious about an audio career. “I started doing some research just seeing where could I get my audio engineering skills beyond YouTube,” she says. “I did a search that said “top audio engineering schools,” and Recording Connection was number one and two. Desiree says she was drawn to the program because of the affordability and flexibility working around her job. “I could tell already it would be hard to go to a traditional college for that and maintain a job,” she says. “I’ve seen my friends do that. I know it’s possible, but I really just didn’t want to go back to school like that. And…it’s more of a mentoring thing. You just sit one on one, or maybe two people at one time, talking with your mentor. And I was like, ‘That’s perfect for me.’ Especially since I’m the type of person I have really be involved with the teacher to really grasp it…I called that day when I researched it, and I really didn’t have any second thoughts after that.” Mentor Ric Web has been a great fit for Desiree. “He is just very open and willing to do whatever I feel like needs to be done. He says, ‘Hey if you just need to come and mix, do that. If you want to bring an artist, do that.’ You can’t really do that in the classroom with a set curriculum, especially me…Whatever it takes for me to get it, he’s going to make sure that I get it. And that means a lot.” As Desiree talks about her plans for the future, it’s apparent her prior experience with one of the nation’s top marching bands is still fueling her passions. “I know a lot of artists having been in the band at Tennessee State University Aristocrat of Bands,” she says. “I know a lot of artists who are looking to be heard and get known…I definitely want to mainly engineer, track, own and operate my own recording studio. I want to be able to house a symphony and be able to record symphonies for film.” Speaking of film—Desiree also expresses an interest in getting into the field of film audio. “I always put it to people like this,” she says. “You’ve seen a movie, and sometimes it is not always the best quality…You can stand a movie that doesn’t really look the best, but if it sounds good, you can keep with it. But I can’t, and nobody I’ve asked this question to can stand a movie that sounds bad. It’s something about sound that really creates the reality of everything. It’s just something that I feel that I can just really do good at. I love just enjoying sound, period, as creative and loosely as it can come.” Even with her current paid gig and her dreams for the future, Desiree wants to hone her skills even further, and plans to jump right into the Recording Connection master’s program with her mentor Ric as soon as her basic program concludes. “I figured, why stop just with the basics?” she says. “I’m just very intrigued to learn what I’m going to learn from here on out because I feel like I have everything. So if there’s a master’s program, I’m like, ‘Oh, there’s more? Okay, well, let’s press on, please.’” **Check out our video on How to Produce Great Vocals in Pro Tools, down below! The interview below is a rare conversation with not one, but three Film Connection mentors. Teaming together, mentors Jim Degroot, Tony Reale and Sean Bowers have built their production company, Creative Edge Productions, into one of the premiere video companies in the Green Bay, Wisconsin area, handling everything from music videos to feature length productions, as well as serving major commercial clients like ABC, Disney and (of course) the Green Bay Packers! In the conversation below, Jim, Tony and Sean talk about how they formed their company, the advantages and challenges of forging success in a smaller market, and their passion for helping students find their footing in the industry. Enjoy! RRFC: So how did Creative Edge Productions come about? Tony Reale: Well, I started off as a video hobbyist, and just fell in love with the art form and became obsessed over trying to create the same quality and look as Hollywood. I learned, over the course of time, the equipment and the tools and the application of those tools that are required to do it. And as I did it from a hobby standpoint, it kind of grew into the point where I felt I was comfortable charging customers. For me, I just did a one man band for a while, started the company name. And, as we grew in that realm, I discovered that there was no way I could do this by myself to the level that we need to accomplish. So I started working with Sean and Jimmy separately and eventually we became partners together and grew the company to the point where we are each able to head up the departments of pre-production, production, and post-production and that’s where we sit as a company now. RRFC: Did you guys all have a passion for video and film when you were young, or was it something that later on you got into? Tony: I’ll start. I liked graphic design; that was my main background. I loved the creative arts and that realm, and it wasn’t until I actually bumped into video through graphic design that I discovered I had a knack for it and really enjoyed it. I always loved films but never really thought that it was something that I could do until I picked up the camera and just started playing around and enjoying it. Jim Degroot: The interesting thing is the backgrounds that we came from and ended up here…you wouldn’t expect it. I grew up not knowing what I wanted to do and entered the jewelry world. What I did with my partners at the jewelry store is, we just went after learning how to go and take market share…In order to market well, you need to tell a story well. And a lot of times that’s a 30-second or a 60-second story, but you need to speak differently. And so, in a nutshell, I was working with jewelers doing consulting when Tony and I started working together because we started creating some advertisements and TV commercials. So that’s how we got together. Sean Bowers: My background I was really into art, a lot of drawing and painting, and that turned into the digital form of that, and then getting involved with graphic arts and graphic design. And through that, I ran into Flash, and I started working with animation. I’ve really enjoyed animation. I’ve always been attracted to visual sets in the movies and love the behind the scenes of that…So now I do a lot of 3D animation here and editing. RRFC: When you guys were first emerging onto this market, how did you go about showing value in your skills to potential clients? Was there any particular path you went down to find work? Tony: What separated us apart, I think, was our goal of achieving a national quality of work but staying within our area, staying in Green Bay which is a smaller market [with] lower overheads, and knowing that we’re going to be working with clients with a lower budget, but then still trying to accomplish that look. And that was done through, of course, skill and equipment and all that kind of stuff…We grew as a company very quickly, and the benefit that we have by growing that quickly is we didn’t really lose that many clients. We had a few that were one-offs, but many of our regular clients grew with us, and we got new clients along the way. We created a library of stuff that established our look, and that’s where we stuck…I would say in the past three years we’ve been pretty steady at creating that same look and that same feel for all our work. RRFC: What kind of unique filming opportunities or situations does Wisconsin allow for a business like yours? Jim: Well, of course, we have all the seasons to deal with, so that’s a benefit and a curse at the same time. Our summers are honestly short, but they’re limited to a certain area and there’s only so much you can schedule in that period. You get a new client on board who wants a project, and we’ve had it happen several times where a client comes in around August or September, and we’re trying to rush to get a project out before the leaves are off the trees. But at the same time, we do get all the seasons to experience and to work with…The advantage that we have is it’s not an overly saturated market, and by focusing our marketing on web presence and in ranking dominance, we’ve been able to quickly grow as a young company to one of the top ranked video production searches on Google for the entire state. Sean: Because of our location, which equals lower overheads for us…if a company is looking at a place in Chicago and looking at us, and we have comparable skills, it will be cheaper a lot of times for that company to hire us to fly out, to travel and do it because of our lower overheads in the area that we’re in. RRFC: When you guys meet with potential students, how do you guys go about discussing what exactly they’re looking to get out of the program, and how do you incorporate them into some of your daily business activities? Jim: One of the things that I think we’ve really learned about the video business is it takes a pretty darned good work ethic, meaning you’ve got to speed up on time, you’ve got to be prepared, you’ve got to hustle the gear and stuff like that. So, in essence, you’re not going to go far in this business if you’re lazy, and our first discussions were really, let’s talk about work ethic, let’s talk about showing up on time, let’s talk about those basic things. And then secondarily, really, is the desire to make a life in the business of video, and what does that look like? The questions then are—The reality of it is, we need things that pay the bills, and sometimes those aren’t fun, glamorous, exciting things…getting in a van and driving to New Hampshire and shooting the most boring things in the world. The check is there. And then you do fun things like music videos and fun TV commercials and things like that. So it’s also showing those students that you’re not going to pop in making movies right away. These are some of the dues you got to pay. RRFC: Let’s talk about one of your students, Jocelyne Berumen. What is she trying to get out of this program? Tony: Any time I’ve been writing a scene, she always comes over and asks for details about it. So it seems to me that she likes to get a general edge which is important to understand. Just as much as a conductor needs to know how every instrument is played, in video, it’s really important to know how every department runs so that you can be efficient in your own department. I think she does show an interest in being able to shoot…on her own, which I give her props for because we’ve met with a lot of students [from other schools] that just don’t know. There’s tech colleges in the area, and they’ll come through and they’ll even go through the whole program and leave and say, “I don’t really know what I want to do.” RRFC: As Film Connection mentors, what do you sort of selfishly get out of this program? What do you guys like about it? Tony: We’re all educators. I have a YouTube channel that Sean and I both work on. We have over 70,000 subscribers. Jimmy has educational resources for jewelers that he works with. So we all like educating. We learned most of what we do online based upon. . . there wasn’t much for YouTube at the time, but just forums and sharing information and people being generous. And so we love giving back to it. [Before] this program—in all honesty, we’ve had interns come through from tech college. A couple have been okay. Most of them have just not had the right ambitions…Jocelyne is definitely has a much stronger ambition towards it. And when we see that, we really like helping people get there because this area doesn’t have the strongest film community…We’re always happy whenever we can help somebody to get connected in this area. Jim: One of the things that Tony and Sean particularly enjoy about working with Jocelyne is that the program takes you through movies, and Sean and Tony are huge movie buffs…The great thing about it is I think what Film Connection and particularly these two guys are helping these students learn…is what makes a good movie good? What makes a bad movie bad? And is it the story line? Is it the production? That’s one thing that they’ve taught me as well, and so that’s what I would tell you I think is a good thing about the Film Connection. 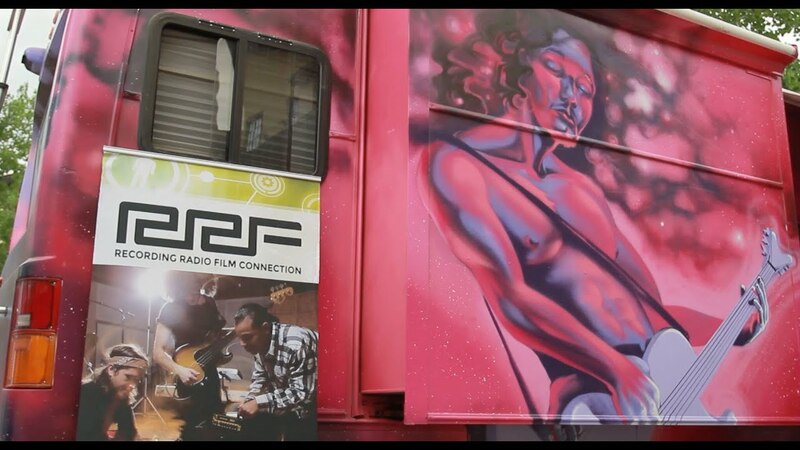 Recording Connection student Tony Montejo (Los Angeles, CA) recently had the opportunity to travel with the Jam In the Van team and learn about live sound! Check out this funny video on his experiences below! Did you know we’ve got tons of how to videos on YouTube? Watch and subscribe!